Thinking of Visiting Cologne With Your Dog? No? You Should Be! One of the biggest joys we have as dog owners is spending quality time relaxing and having fun in our pet's company creating memories that will last. While travelling abroad with your dog might be something you haven't tried as yet, it seems many more dog owners are getting prepared for European adventures arming themselves with pet passports. Dog owner and travel writer Paul Wojnicki has been sharing his overseas adventures with us over the last year. He left us last month enjoying the wonders of Amsterdam promising more to come. Last month I wrote about a recent trip with DFDS Seaways using their new dog friendly service for foot passengers between Newcastle and Amsterdam. We had a great weekend in the Dutch capital and would like to have stayed longer, but we have a date with another great city for dog lovers; Cologne in nearby Germany. The journey from Amsterdam to Cologne is relatively fast and comfortable onboard a German ICE train, which is their equivalent of our Inter City services. Falco is glad of the rest after walking, swimming and running that morning and so he sleeps through the first two hours of the trip. When he does wake it's to the sound of a fellow passenger asking his name and giving him a stroke. 'His name's Falco,' we tell him. 'Oh, after the Austrian singer?' he asks. It's a question we get often. This is one of the great aspects of travelling with a dog; you meet and talk to people who would probably never speak to you otherwise, just as you might in the local park or on your morning walkies. Dogs are a great ice breaker wherever you are in the world and our love of them enriches our lives on all levels. We spend the next forty-five minutes with this Cypriot couple, who tell us they miss their dog when travelling but they cannot bring him with them from northern Cyprus easily. I empathise with the difficulties of travelling from an island with a dog and think to myself once again how much easier things would be if Eurostar allowed dogs on board. Falco licks the couple goodbye in Cologne station and we exit to the rear to find the massive facade of the Dom (cathedral) facing us. Falco is in his element taking in the sights, sounds and smells of the square while the kids run around waking up their legs after the journey. The centre feels secure and relaxed and there's no hint of tension, as some of our papers would suggest exists in Germany. People are just going about their everyday business and - as it's still the weekend - this seems to involve lots of eating and drinking in the many pavement cafes and restaurants. Our hotel is a very short hop on the S-Bahn (a suburban train system found in many large German cities) and our bags are dropped off ten minutes after we arrive in town. After which we explore the park to the rear of the hotel for half an hour before catching the S-Bahn back to the cathedral. Then it's all aboard the tourist train from the cathedral to the river front. It's an easy walk but the kids want to ride the train, and we're exploring the banks of the Rhine and the cobbled streets of the old town for the afternoon. 'Can we go on a boat daddy?' Harrison asks. 'But I think Falco wants to go on now,' Harrison suggests. And he's right because just ahead I notice a Pug sailing past us on one of the riverboats, and Falco being Falco has decided he would like to say hello. I like to give him enough freedom to make his own friends but sometimes you need to say no! The following morning I'm up early exercising Falco and tiring him out before the boat trip on the romantic Rhine to one of Germany's most famous hills near the town of Konigswinter 30 miles downriver from Cologne. It's a four hour voyage to Konigswinter and there's only one ferry a day that makes the full trip. Luckily the ferry stops in Bonn, the former capital of West Germany, and from here the boats to Konigswinter are more frequent so we break the journey up with a walk along the river and lunch in the former capital. The KD Lines boats serve food and drink onboard so we could easily have made the journey in one go, but the children get restless and need exercising every bit as much as Falco. 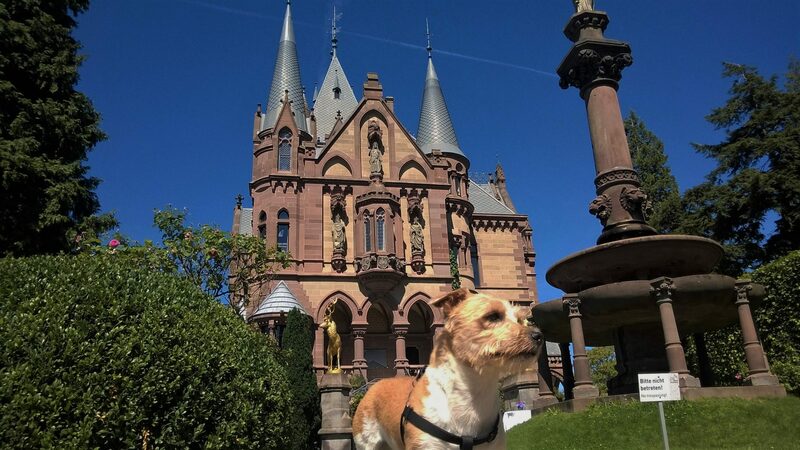 When we do arrive in Konigswinter that afternoon we needn't worry about a lack of exercise as we are here to climb the legendary Drachenfels hill that looms behind the town, crowned by the ruins of a 12th century castle. The hill is one of the most famous in Germany and a cave on the hill is said to have sheltered the dragon - or Drachen - which was slain by Siegfried, Germany's equivalent of King Arthur. The hill looks daunting from the town, not because of dragons, but because the road that leads to the summit is so steep for our 1 year old's pushchair. Luckily for those not fit enough to climb the road there is a funicular service from the town to the summit. However we decide to forgo the dog friendly funicular and test our legs on the hill. It's a strenuous walk but the terrain is straightforward enough and Falco helps by pulling ahead on his lead. Around half an hour later we reach the summit; all out of breath except Falco, who's still raring to go. Despite our exhaustion, the views of the Rhine from the summit are easily worth the effort. Our eyes follow the same river that we sailed down that morning all the way back to Cologne on the horizon. It's possible even from here to make out the truly massive Kolner Dom cathedral that was actually built using stone quarried from this very hill. Byron wrote that the only true friend he'd had in life was his beloved Botswain and as we head down to Schloss Drachenburg, a wonderfully ornate castle lower slopes of the hill, later that afternoon I think of how blessed we are to have Falco in our family and how I'd hate to leave him behind when we travelled. The rabies that Botswain died from seems oddly relevant as it was this same terrible disease that prevented dogs from entering the UK without a lengthy quarantine until relatively recently. These thoughts are banished when we enter the grounds of the Schloss (castle), and are replaced with thoughts of how beautiful the continent we live on is and how much there is to explore. And Cologne is the perfect starting point because not only is it a wonderful city in its own right but it has some of the most majestic waterways in the world right on its doorstep. And for those wanting to travel further afield then it's worth noting that it has recently taken over from Paris as the nerve centre of Europe's sleeper train services. These dog friendly trains have beds and private bathrooms in compact cabins that make overland travel so much simpler than driving long distances, be that to the Alps in Austria, the lakes of Italy or the imperial cities of Eastern Europe. Cologne is easily reached from Calais or the ports of Rotterdam and Ijmuiden in Holland by car. Travellers reaching the continent on foot by DFDS Seaways can catch a direct German ICE train, which run every two hours and cost as little as €29 each way. Cologne is a really easy city to navigate by public transport and there are no shortage of hotels that accept dogs. We stayed at the AZIMUT Hotel Cologne City Centre, which had fantastically large family rooms that were spotlessly clean. It’s also right next to the S-Bahn station which makes getting around town a breeze, and had a large park right behind it. The staff were extremely friendly and helpful and rooms start at a very reasonable £61 per night. Konigswinter can be reached using KD Lines ferry/cruise boats in around four hours or in an hour by train. Why not take the boat in one direction and the train in the other? There is no shortage of parks and other dog friendly attractions in Cologne; the old town and riverfronts are particularly pleasant. For more information on any attractions or hotels visit the super helpful team at www.cologne-tourism.com or step into their office opposite the cathedral, just outside the main train station.